Conundrum | Comics I Don't Understand - This site is now being updated daily at http://www.comicsidontunderstand.com. Please change your bookmark if necessary, and notify any web site with a link to the old address. surely this should be on the Arlo page!! The cat seems to have confused “moral conundrum” with “mole tunnel”. “Willy” was the name of the mole into whose tunnel his buddy fell. This is one of those strips that I adore Get Fuzzy for. It’s mildly funny when Satchel misunderstands Rob, but it’s always hilarious when Bucky does. Not only is Bucky inscrutable, he’s DANGEROUSLY inscrutable. I certainly don’t see what’s Arlo worthy about this strip, or even cidu worthy. Bucky is not very smart even though he talks, and he thinks a moral is some kind of rodent and conundrum is whatever hole/lodge it lives in. Nuff said. The whole strip is an exercise in applied surrealism. It’s mildly funny. 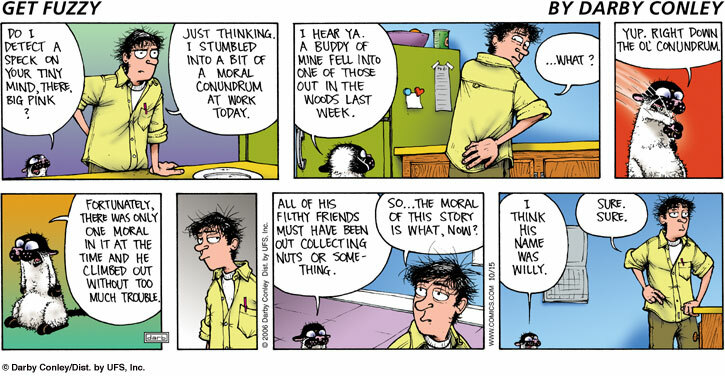 ‘Conundrum’ to Bucky sounds like ‘condominium’, so a moral conundrum is a place where morals live. By the ‘filthy friends… gathering nuts’ comment, Bucky thinks ‘morals’ are ‘squirrels’, so his friend fell into a squirrel hole with only one squirrel in it at the time. Rob asks what’s the moral of the story, and Bucky replies with the squirrel’s name – Willy. I loved this one, made me laugh out loud. I think it has as much to do with Bucky’s personality as anything else. Namely that Bucky feels he is an expert on everything even when he’s really clueless. He just keeps digging and digging–and Rob just humors him, leading to these surreal conversations. Willy? Conundrum? Nuts? Yep, it’s an Arlo. BTW, does Rob ever comb his hair? I thought that this cartoon was pretty funny, but I still don’t see why it’s an Arlo, even after Charlene’s comment. Can someone explain more explicitly? Bill, under the new system, how do people give Arlo explanations for a comic not originally tagged as an Arlo? Just in the normal thread? Autumn, every time somebody posts a response, I get a copy in my e-mail. since I pretty much live online, if anything Arloish turns up, I’ll spot it pretty quickly and move it if necessary — so it isn’t anything anybody should worry about.